Come find us in the community. The South Hero Marsh and adjacent land support a variety of habitats and birds. According to VT eBird 162 species have been reported from this location. On Saturday, April 27 join the members of the GMAS and the South Hero Land Trust for a walk down this trail in search of Rusty Blackbirds and other species that are returning to Vermont. This event is free and open to the public. We will meet in the parking lot at Tracy Road to begin this walk. Join us for our first bird walk of the Spring season on Saturday morning, March 30. We will walk out to the bridge on the Colchester Causeway looking for ducks, geese, and possibly a Bald Eagle or two. The weather for Saturday morning might include showers, so dress warmly. The first part of the trail is icy, so wear creepers if you have them. Bring binoculars and a spotting scope if you have one. too. We will meet at the small parking lot on Mills Point Road at 8:00 A.M. to begin this walk. To get there drive to Malletts Bay and the intersection of Lakeshore Drive/Holy Cross Road, Porters Point Road, and Colchester Point Road. Continue on Colchester Point Road past Airport Park, bearing right onto Mills Point Road where the road divides, for 1.5 miles. There will be a small parking lot on your right just before the road crosses the bike path. 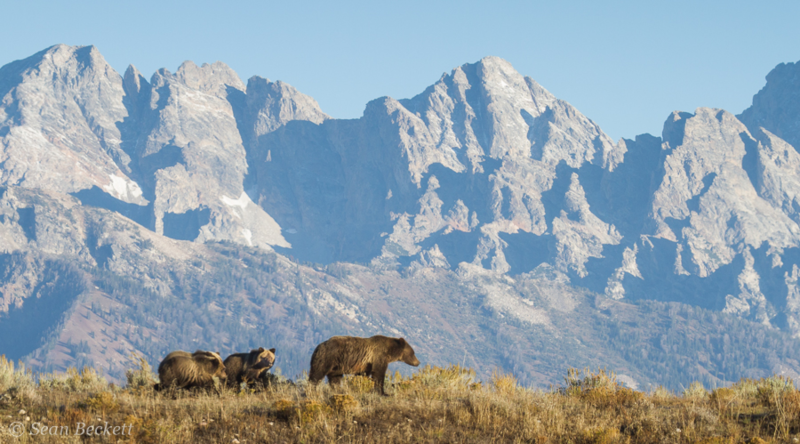 Please register in advance by responding to this e-mail to receive updates on conditions at the Causeway..
Bison, moose, wolves, and bears are entangled in a delicate dance of survival in the Greater Yellowstone Ecosystem. Witness grand migrations, turf wars, life, death, and struggle in this photographic odyssey to the wildest of the west. Join wildlife safari guide and North Branch Nature Center's Staff Naturalist Sean Beckett on an adventure following the life of a grizzly bear in "America's Serengeti," then investigate the challenges of sharing the landscape with our nation's most charismatic and controversial creatures. This program is free and open to the public, although donations are always appreciated. The Dorothy Alling Library is located on Library Lane. in Williston village. Free parking is available on site. For more information select the Contact Us button on this website and send us an e-mail. Join the members of the GMAS for our early morning bird survey at the Green Mountain Audubon Center, then visit the Birds of Vermont Museum to count the birds arriving at their well-filled feeders. Join us at any time on Saturday morning to celebrate the Great Backyard Bird Count and Vermont’s winter birds. Akikiki, Akeke’e, Puaiohi. Saving Hawai’I’s native forest birds. Join Mark LaBarr, Audubon Vermont’s Conservation Program Manager as he recounts his travels to Hawai’i volunteering for the Kaua’i Forest Bird Recovery Project. Hear how some of the last endemic birds are struggling to survive in the high elevations of Kaua’i’s Alakai Swamp. Mark will talk about the projects efforts to protect and preserve the birds and their habitat as well as provide some stories of a Vermonter in Hawai’i. This program is free and open to the public, although donations are always appreciated. Free parking is available on site. Join us for our monthly bird monitoring survey at the GMAC. We will meet at hte Office parking lot to begin this walk. Date: Wednesday, November 7, 2018 at 7 P.M. Location: Richmond Free Library, Bridge St., Richmond, Vt. Birds, Words and Music is a unique celebration of our place in nature, expressed in poetry, reflection and music. It blends the talents of four Vermont artists: Scudder Parker creates poetry at the rich intersection of nature and people. Bryan Pfeiffer reflects on the joy and meaning of wildlife on the wing. D. Davis (guitar) and Ruth Einstein (violin) stir the senses with a serenade inspired by the natural world. First performed before a packed house at North Branch Nature Center, in Montpelier, Vermont, this special event is brought to you by Richmond Free Library and the Green Mountain Audubon Society.. Birds, Words and Music is a relaxed and intimate evening of music, ideas, nature and the force of the written word. This program is free and open to the public, although donations are always appreciated. Join us for our annual field trip to the Dead Creek WMA to see Snow Geese and other migrating waterfowl. We will meet at the goose viewing area on route 17 to begin this walk. In 2017 Bob and Shirley Johnson traveled to Chile for a birding trip. In this program, Shirley will describe the birds, plants, and scenery they saw during this trip showing great pictures taken by Bob, including spectacular views of Chile’s volcanoes, mountains, flowers, birds and wildlife, including pumas, penguins, plantcutters, pelicans, plovers, and many more! Shirley Johnson is a long-time member of Green Mountain Audubon Society and has traveled widely on a variety of birding trips. She especially enjoys showing pictures of the birds she has seen and sharing with others her fascinating observations about them. The new Catamount Community Forest is nearly a reality. Join the members of the GMAS for a late summer bird walk to celebrate this event. This event is free and open to the public. however, donations to the Trust for Public Land are still being accepted to support this acquisition. You can donate to this project online at tpl.org/catamount. Come hear the stories of individual grassland birds and their young and be inspired as Vermont landowners and communities to halt the declining populations of these birds in the northeastern United States. Many Bobolinks and other birds born in and around Shelburne Farms return to breed within 1500m of where they were born – generation to generation. This allows us to uniquely tell the stories of bird families: where each was born, who its parents, siblings, and cousins were, where it migrated, where it returned, and its breeding success. Discuss how the timing and intensity of haying and grazing affect these birds, and how management opportunities among Vermont’s farming and landowner community can balance bird and farmer needs. Join the members of the GMAS for our annual Birdathon bird walk at Mount Philo. This event is our one and only fundraiser held during the year. All donations are appreciated. We will meet in the parking lot at the base of the mountain and walk to the summit counting birds along the way. This event is free and open to the public. Please register in advance by responding to this e-mail. To get there take route 89 to the Waterbury/Stowe exit. Turn south on route 100 toward Waterbury, then turn west onto route 2. About 1 1/2 miles from this point look for Little River Road. Turn north on Little River Road. The parking area is about 2 1/2 miles from the turn onto Little River Road. Park at the Waterbury dam fishing access near the entrance gate. Do not drive into the park. The park is opening on May 19 and a fee will be charged if you enter there. The Data Are Back! In summer 2016, Audubon biologists placed geolocator backpacks on Blue and Golden-winged Warblers in the Champlain Valley. Light level geolocators allow biologists to track birds throughout their migration. In summer 2017, they recaptured some of these birds after a full season of migration . Now, one year later the data have been downloaded and interpreted and we’ll get to hear first-hand what these elusive warblers have been up to. Join Audubon Vermont’s Mark LaBarr and Margaret Fowle for a discussion of migration and wintering locations of Golden and Blue-winged warblers fitted with geolocators in the Champlain Valley. This program is free and open to the public. Free parking is available on site. Long before birds showed up on Planet Earth, insects were already on the wing. They invented flight. Four hundred millions years later, butterfly diversity puts bird diversity to shame. Name a color or pattern or behavior — you’ll find it expressed in these gossamer insects. And it all plays out at your feet. In this program, Bryan Pfeiffer brings you the skills for discovering and enjoying butterflies (with a brief detour to moths, which are about 20 times more diverse than butterflies). This program is free and open to the public. The Richmond Free Library is located on Bridge St. in Richmond. Free parking is available on site. Join the Friends of Missisquoi NWR for their monthly monitoring walk. Please register in advance for this event by sending an e-mail to us. Join us for a walk on the Colchester Causeway. We expect to see a variety of ducks, geese, and possibly a Snowy Owl. Please register in advance for this event. Recently Mark Paul participated in a safari in Uganda, accompanied by world class photographer, Mark Sisson and 11 other wildlife photographers. In this program Mark will show us his pictures, tell a few stories, and discuss the finer points of wildlife photography. Join us for this entertaining and instructive program. Date: Wednesday, February 21, 2018 at 6:30 P.M.